For over 60 years, International Translation Day has been celebrated every year on 30th September. The date was originally chosen to mark the occasion as it is the feast day of St. Jerome, the patron saint of translators. Set up by the International Federation of Translators (FIT), this annual celebration of all things translation has long been marked on the calendars of language lovers the world over. Here at The Translation People, it’s always been an important day for praising our talented linguists and reflecting on the positive contribution they make to international business by helping to open up global markets and allowing companies to communicate with prospective clients, no matter what language they speak or where they are in the world. Translation services allow companies to undertake a whole host of activities from creating international marketing campaigns, training their international workforce and bidding for projects across the globe. This year the worldwide festivities are set to be extra special. Following a resolution in May, 30th September 2017 will see the first time that International Translation Day has been officially recognised by the United Nations. The UN has 6 official languages- Arabic, Mandarin, English, Russian, French and Spanish. Without the help of specialists fluent in each of these languages, the organisation would undoubtedly struggle to function. For a typical 6-language UN meeting, for example, at least 14 interpreters are required. Before the meeting has even begun, a team of translators for each language must work efficiently to ensure that all the documents for consideration are translated into all 6 languages. During the meeting, another multilingual team must pen down all the notes and minutes, ensuring they are then translated and distributed to all delegates within a matter of hours. During his presentation to support the resolution, Andrei Dapkiunas, the Permanent Representative of Belarus to the United Nations said, “This resolution is about the underappreciated role of language in the life of our human society.” It’s fantastic to see that professional translators are now finally getting the recognition that they so richly deserve from this organisation. Even beyond the walls of the UN’s headquarters, it’s clear that translators play an integral role in building connections between people and organisations. 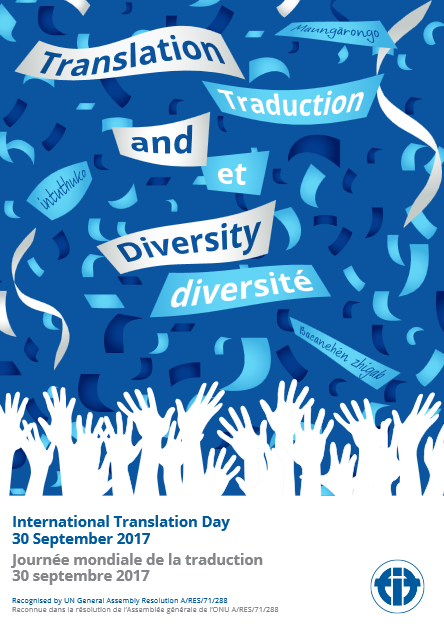 This year’s theme for the day, as chosen by the FIT, is Translation and Diversity, which is particularly pertinent at a time when fostering understanding between cultures is more crucial than ever. Quality translation services are invaluable when it comes to nurturing this understanding, especially in the world of business. Whether spoken or written, in relation to technology, marketing, science or law, our translators make it their goal every day to ensure that language barriers are a thing of the past. In doing so, they connect us with the rest of the world and show us the endless benefits that come from communicating and working with people from other countries and cultures. Please join us in thanking translators everywhere and wishing them all a very happy International Translation Day! Interested in learning more about the opportunities that translation can offer you? Please do not hesitate to contact us for more information.